The young puppy with no name summonses up all the strength he has to greet you in his confined kennel space, despite battling a deadly disease that might claim his life. The gracious pup with the puppy eyes is happy to have any company because it’s the only thing keeping him sane from the chaos that is the Miami-Dade Animal Shelter (MDAS). Located in Miami, the MDAS is a place one wouldn’t wish on his own enemy. Dogs are given just weeks, and sometimes just days to find forever families, before the unthinkable happens: euthanasia. Due to poor finances, the MDAS is unable to adequately treat medical conditions like parvovirus, a highly treatable, but deadly disease affecting puppies. Biologically, puppies have weak immune systems, and so a disease like parvovirus if left untreated, can overwhelm their tiny bodies ultimately leading to death. Thankfully, this pup has you, and that means that he’s still in the fight. Fidonation, if you or someone you know is interested in giving this precious pup the forever family he rightfully deserves, please contact the Miami-Dade Animal Services at (305) 884-1101 and reference the shelter ID #A1854585. Additionally, please share this story on Facebook or Twitter so we are closer to finding this precious pup the forever family he rightfully deserves. We have done it before, and can certainly do it again. 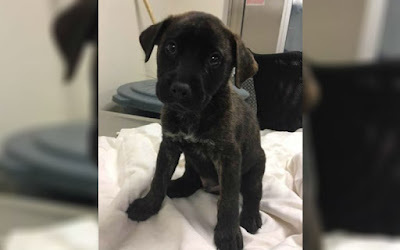 0 Response to "Sick Puppy Living in Kill Shelter With Parvovirus, Looking For 11th Hour Miracle"